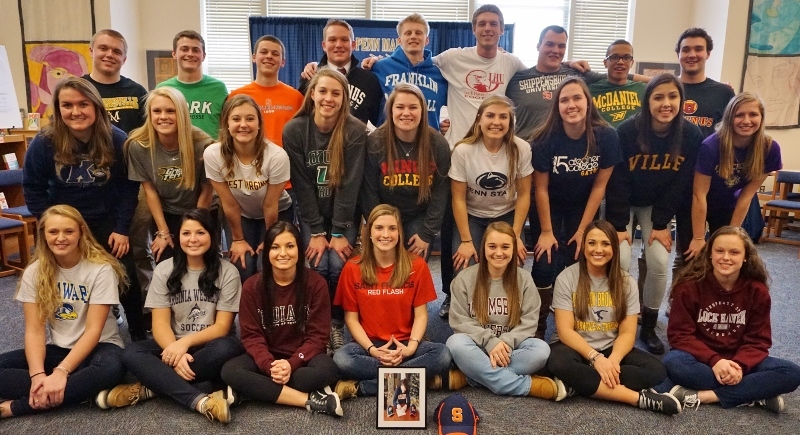 Family and friends gathered Wednesday in the Penn Manor High School library for National Signing Day to honor 25 seniors who will participate in collegiate sports at 22 colleges and universities next year. The group includes four members of the state championship-winning field hockey team, along with students who will compete in football, soccer, lacrosse, tennis, volleyball, wrestling, track and field, basketball and acro – a cross between cheerleading, acrobatics and tumbling. Seven students will attend Division I schools, nine will enroll in Division II schools, and 10 are headed to Division III colleges and universities. One of the students honored Wednesday, Matt Keller, graduated early and is already attending Syracuse University on a football scholarship. 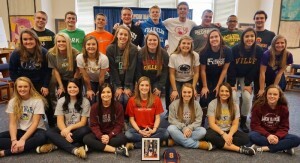 According to Penn Manor athletic director Jeff Roth, the student athletes excelled in the classroom as well as on the playing field, earning a median grade-point average of 3.82. One senior, tennis player Katina Jones, has earned a GPA of 4.41. Pictured, from left, are, front row, Abigail Schlegelmilch, Bailey Kramer, Athanasia Kontanis, Emma Evarts, Brionna Kline, Hailey Spicer and Anneli Starry; middle row, Carolyn Sloss, Kirsten Gibson, Jordan Hess, McKenna Edwards, Carolyn Weber, Cassie Kline, Brittany Imel, Gabriella Anders and Katina Jones; back row, Tyler Spangler, Wyatt Barnett, Nate DeBerdine, Zeb Pfeiffer, Tanner Erisman, Eric Shufflebotton, Noah Braun, Gerrin McKinney and Nick Kirk.